Michael gripped the rock in his right hand so hard that his fingers left imprints in the stone. His jaw clenched, his eyes shut fast against the pain coursing through his veins. The woods were sparse this far north and the ground beneath him grew colder and harder as the strength was sapped from his inhuman body. His brother Asreal, transformed as he was to a predatory creature, had his fangs embedded deep in the side of Michael's throat, and with each pull and swallow, Michael experienced a new and more intense agony. When four female angels were created for the archangels Michael, Gabriel, Uriel and Azrael, a chaos spurned by jealousy erupted, and the archesses were secreted to Earth. The four favored archangels followed, prompting a search that has last millennia. But for Uriel, the former Archangel of vengeance, the search ends the moment he lays eyes on Eleanor Granger, his one true arches. Can he protect her from the danger lying in wait for her-and win her heart? When I finished reading this book, my first thoughts were that Joss Stirling might have some competition when it comes to her gorgeous Benedict brothers in her books. The brothers in this book were hot! Older, maturer and arch angels too. What more could a girl want? I love the way authors are now working out ways to get past this instant love syndrome which has appeared in so many books recently. 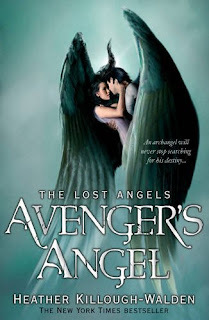 Within Avenger's Angel, Uriel is on the look out for his pre destined arch angel who was pushed out from Heaven over 2000 years ago. So instantly on meeting her, he knows she is the one he loves. She also has feelings for him but can't quite work out where they are coming from. So instant love can be achieved as long as you are crafty. I found all the characters to be believable and each interesting in their own way. Each brother stood out from the others. My favourites were definitely Samael and Azrael. I suppose I am meant to hate Samael but I think he is fabulous. He is the Fallen One, the dark angel and yet I found him intriguing. I must be a sucker for the bad ones. The same goes for Asrael, who is quite different from the other angels, he isn't technically bad, but he does have unusual habits. The plot shocked me. The author cleverly hid some plot lines in the book that exploded at the end. I couldn't have guessed what was going to happen if I tried. The ending came with a feeling that the situation had been dealt with whilst someone sneakily opened another can of worms and let them loose to play havoc on the rest of the series. A seriously amazing ending. My only niggle with the book was that I was surprised how easily Eleanor seemed to succumb to Uriel. I found her submission to him a little hard to take. Apart from that I thought this was a really good start to a series and I am intrigued how the other three angels will come across their chosen ones. I was definitely left wanting to know more and I am looking forward to reading the next book in the series. Ooh this sounds really good, I like the sound of pre destined love instead of insta-love. This sounds like a angel novel I would love. Shocking plot, hot angels and an amazing ending, what more could a girl ask for? I received the copy I won yesterday and have started reading. Am only in the opening chapters but am pleasantly surprised already at a different take on vampire too. Instant Love Syndrome - what a brilliant term to use. I like the sound of this one and the cover is great! It does sound like a good start to the series. Captivating review! I hope the next book lives up to the ending of this one. This sounds so good, and I am drooling over that cover. I love the cover of this one and the romance sounds great! I don't usually read adult books of this type (I generally stick to YA paranormal) but this sounds like it might be worth checking out!